Over a period of six years, Zhongxing Telecommunications Equipment Corporation (ZTE), China’s largest publicly traded telecommunications manufacturer and the fourth largest in the world,engaged in a scheme to ship more than 20 million U.S.-origin items to Iran. 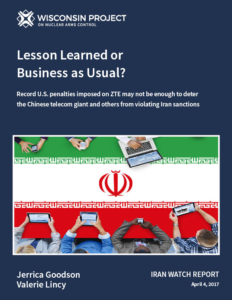 ZTE used multiple avenues to evade U.S. sanctions and export control regulations, including establishing shell companies, falsifying customs documents, and then actively misleading investigators when details of the conspiracy came to light. Top executives were instrumental in orchestrating the scheme and the attempted cover up. ZTE recently reached a plea agreement and settled with the U.S. Department of Justice (DOJ), the U.S. Department of the Treasury’s Office of Foreign Assets Control (OFAC), and the U.S. Department of Commerce’s Bureau of Industry and Security (BIS) for a combined penalty of $1.19 billion. The agreement was approved by a federal judge in Dallas on March 22 and ZTE and its subsidiary were removed from Commerce’s Entity List on March 29. Media reports and government press releases about the case have focused on the size of the monetary penalty. It is OFAC’s largest settlement to date with a non-financial entity and the largest criminal fine ever for an International Emergency Economic Powers Act (IEEPA) violation. But does it go far enough? The fine and probationary measures may not be sufficient to deter ZTE and companies like it from pursuing similar illegal actions in the future. ZTE’s orchestrated, company-wide, multi-year effort to circumvent U.S. export controls and sanctions landed it and some of its affiliates on the Commerce Department’s Entity List. However, ZTE and its China-based subsidiary ZTE Kangxun were almost immediately granted a temporary general license, thus exempting them from any U.S. trade restrictions. And at least two companies used by ZTE to supply U.S.-origin goods to Iran and North Korea were left off the Entity List entirely. In addition, the corporate compliance and oversight changes mandated in ZTE’s plea and settlement agreements may not be far-reaching enough to guarantee a change in behavior. Only a handful of officials directly implicated in the conspiracy were removed, while many other top officials likely aware of the illegal activity remain in place. Finally, an exemption in the plea agreement stipulates that ZTE, whose largest shareholder is a Chinese state-owned enterprise, may not be required to turn over documents that the Chinese government deems “state secrets.” This may allow the company to conceal evidence of U.S. export control and sanctions violations in the future. To read the full report, click here: Lesson Learned or Business as Usual?